I have many options for your ceremony from the Elope package at $175.00 being held here at our garden. If you are planning on eloping in Portland, this is not a problem. In Oregon there is a three day waiting period. You will need to wait till the fourth day, after you have purchased your Oregon marriage license from the county. 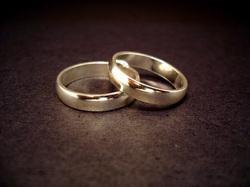 You must have two witnesses, over 18 years of age, for your marriage. Couples eloping in Portland, call me if you have a urgent need to marry now. at the county office and have your Oregon marriage license effective immediately. My standard weddings are $275.00 to start, and vary depending on your needs. This includes a $50.00 non-refundable deposit to reserve your special day, your first consultation is free. You will be able to choose from many different ceremonies from pre-written to historical. I will even do ones you have written or any combination of the above. My job is to make your day a memorable one.